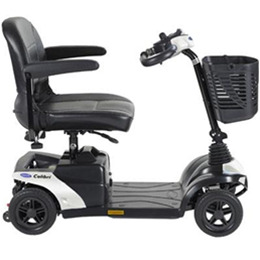 The Invacare® Colibri four wheel micro-portable scooters include the latest elements for comfort, design and convenience. The Colibri scooter line offers a variety of battery, wheel and interchangeable colour sets to fit your lifestyle and personality. Each scooter is programmable through the charger port for acceleration, braking, speed and alarms. A standard 200 Watt motor provides exceptional power while safely adjusting torque. Max speed of 8 km/h (5 mph). Seat to Floor Height: 14.5 - 16.5"